Posted 7/24/2017 6:33pm by Tim Livingstone. Did you ever collect the green and black striped caterpillars as a kid and put them in a jar with milkweed leaves? We did this almost every summer. We would then watch each day as they grew and if we were really lucky we'd see them spin into their cocoons. Over the days we would watch in suspense as the cocoons turned from green to black with orange then one day a beautiful butterfly would emerge. More often than not this happened at night when we were asleep but occasionally we got to see it struggle out of the cocoon and stretch its wings for the very first time. We would always let them go again into the wild so they could return to the place of their ancestors in Mexico. It taught is about one of nature's great mysteries. Three of our workers come from Mexico and they carefully leave all the milkweed when weeding so that the Mariposa (Spanish for butterfly) have food to eat. 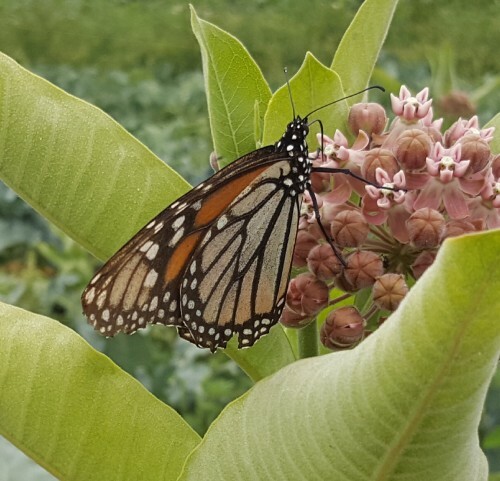 Today I spotted my first Monarch of the season and captured its picture on a milkweed plant in the broccoli patch! Sadly the monarch population almost disappeared all together a few years back but we are happy to see some returning again and hope it makes a full recovery allowing our children and their children after them to continue to experience the magic!